I have been a blonde my entire life. And I have always considered myself to be a "smart blonde" and not one who would be subject to dumb blonde jokes. But in 1985 when we were traveling throughout Europe I had my worst dumb blonde moment. By far. Dave and I were driving throughout Europe with some friends and we had just entered Switzerland. After about five minutes I said to everyone, "Wow! I cannot believe how many hospitals are in this country". Hmmm. If you are not familiar with the Swiss flag, it is a red square with a white cross on it. It looks a bit like a sign for a hospital. As soon as I said it I realized how DUMB my comment was. And to this day, almost 20 years later, my husband won't let me forget it. In fact, the story has been told so many times, my three boys make note of the story ALL of the time. It's ok, I deserved it. Seriously? What was I thinking?? Apparently, I wasn't thinking at all. So my painting today is titled "Is that a Hospital?". It's a tribute to all of the smart blondes out there who occasionally have a dumb blonde moment. It happens to the best of us. One final note, this blog post is not a request for dumb blonde jokes. I have heard them all, I can promise you that. This week's Artists Helping Artists radio show program is titled "Fifty Studio Tips and Tricks" and you can listen to it here. The show airs live every Thursday at 9:00 am PST, 12:00 noon EST. All of the shows are recorded and archived. If you would like to listen to any of the archived shows visit the AHA website. I am offering Monday Online Studio painting classes beginning October 2014! 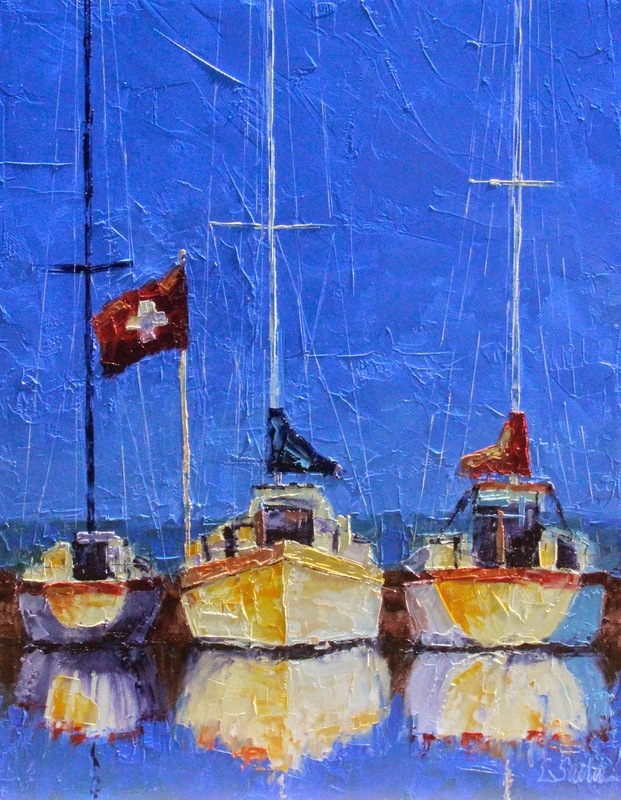 Join me each month as we paint boats, roosters, glass, beach scenes, umbrellas, etc. with a palette knife! Click here to sign up!